A powerful global conversation has begun. Through the Internet, people are discovering and inventing new ways to share relevant knowledge with blinding speed. As a direct result, markets are getting smarter—and getting smarter faster than most companies. Their realization foreshadowed a fundamental shift in the way we do business online. Along with this shift, we see a change in the relationship brands have with their customers. Rather than crafting one-to-many messages in typical marketing speak, brands now have to engage in a conversation with customers. Online this means providing meaningful content and, as a consequence, acting like a media publisher. Marketers need to play in both spheres to effectively build their brands. They need to get past a one-size-fits-all approach to media — the web ain’t TV. Dictating a message to your audience is no longer acceptable. Consumers online expect dialogue, so pairing your brand with relevant and passion-driven topics is one of the best ways to ensure that you are engaged with key audiences. What’s the next step in the blurring of the lines between brands and marketing and media and publishing? Mitch Joel, a social-media consultant and author, says that it could be brands hiring their own journalists and putting out their own publications — filled not with canned marketing messages but actual content. Dubbed “content marketing,” this trend is not just about providing content or using social media for more exposure and increased PR effects. Brands have to provide useful content and participate the new interactions people have with them. More and more, consumers are reading reviews and ratings on sites like Amazon and elsewhere. Or they are asking Twitter followers for their opinions. And they look at who’s behind a service by researching profiles on sites LinkedIn and even facebook. Regardless of industry or sector, your customers are far more informed today than they were just a decade ago. 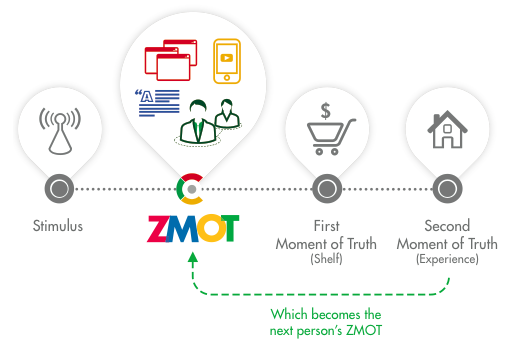 Second Moment of Truth – The first experience customers have with your product or service actually using it. But if you think about the interaction with your brand these days, you’ll notice a gap in the above scheme. There is a significant new touchpoint that’s entered the picture. Between the first and second phases above comes product research and comparisons. So now ask yourself: what will happen when customers google your brand name or product? Do they only get marketing messages from you or do they valuable content that helps them in some way? Chances are there’s also quite a lot of Information about your products and services on the web from a variety of sources. You not only want to be linked to the content they’ll find, you want to be contributing to it. The important part is that this content can’t come across as just more marketing fluff. It needs to be information that’s part of the normal fabric of content, part of the online conversation. By doing this, customers will see you as experts in your area and will engage with you directly. And this brings credibility and loyalty. Instead of advertising, the shift is toward publishing. Instead of buying media, you can roll you own and ‘be there’ when potential customers are researching purchase decisions and gather Information about products and services…. Companies that successfully address customer needs and questions with content add value to conversations that take place online. They position themselves not as “buy me!” banners, but as trusted advisors. Content can shape and create a brand voice and identity. Most of all, content makes a company and its products relevant, accessible, and believable. A big part of the problem lies with companies themselves, which remain trapped in an outdated approach to value creation that has emerged over the past few decades. They continue to view value creation narrowly, optimizing short-term financial performance in a bubble while missing the most important customer needs and ignoring the broader influences that determine their longer-term success. The path for companies to follow, Porter believes, centers on the principle of shared value. This is not about more corporate responsibility programs, but rather a transformation in the way the companies make money. Share value means creating value for the corporation in way that also brings value to customers and to society as a whole. This notion trickles down to content creation: the content brands create must bring as much value for customers as it does for them. Conversation over dictation. Instead of delivering a message to consumers, have a discussion with them. Join and start conversations. Platform over distribution. What matters is how you use a platform to create effective interaction with customers. Service over product. In conversation marketing, you’re providing a service, a continuing dialogue whose course through the Web is unknown. The more value it adds to the ecosystem, the more it will be shared, amplified and celebrated. Iteration over perfection. Good first drafts and speedy responses to consumer dialog will always trump lawyered corporate speak. Engagement over consumption. Simple consumption isn’t very interesting — what’s important is the context of that consumption, and action taken afterwards (liking, retweeting, sharing, linking, clicking). Become a trusted daily companion, not a once-a-year-during-the-Super-Bowl visitor. To understand these changes, think of Johnny Appleseed. A true American pioneer, John Chapman (aka Johnny Appleseed) traveled throughout the eastern parts of America in the 1800s. As the story goes, he always with a bag of apple seeds and planted trees wherever he went. His dream was to produce so many apple trees that no one would ever go hungry. Johnny Appleseed was a legend in his own time with broad “brand” recognition (and that without the help of Facebook, Twitter or Google!). His fame didn’t come from expensive PR campaigns, but from a direct engagement with the people he was trying to help. He is remembered for his generosity, altruism and conversation efforts, but he also owned a great deal of land and was a trusted advisor to many orchard caretakers. Seed by seed he built a small empire, and link by link so can your brand online. So, start seeding your online conversations and grow your brand–not through louder messages about how great you are, but through content with shared value. Chris Locke, Doc Searls, David Weinberger, Rick Levine, The Cluetrain Manifesto: The End of Business as Usual, Basic Books, 2000.